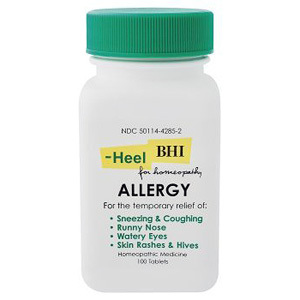 BHI Allergy For the temporary relief of: Sneezing & Coughing Runny Nose Watery Eyes Skin Rashes & Hives One in six people suffers from seasonal allergies. The combination formula found in our allergy tablets helps regulate the flow of irritating histamines and relieves minor allergy and hay fever symptoms safely and naturally. DOSAGE: Adults and Children above 6 years: 1 tablet sublingually or dissolved completely in mouth 3 times daily or as directed by a physician. Infants and children to 6 years: 1/2 the adult dosage. This entry was posted on Saturday, February 18th, 2006 at 1:10 am and is filed under Allergy Relief. You can follow any responses to this entry through the RSS 2.0 feed. You can leave a response, or trackback from your own site.